Last day of July! Tomorrow is August and that means all the Fall collections are showing up! Before we know it, it will be September. 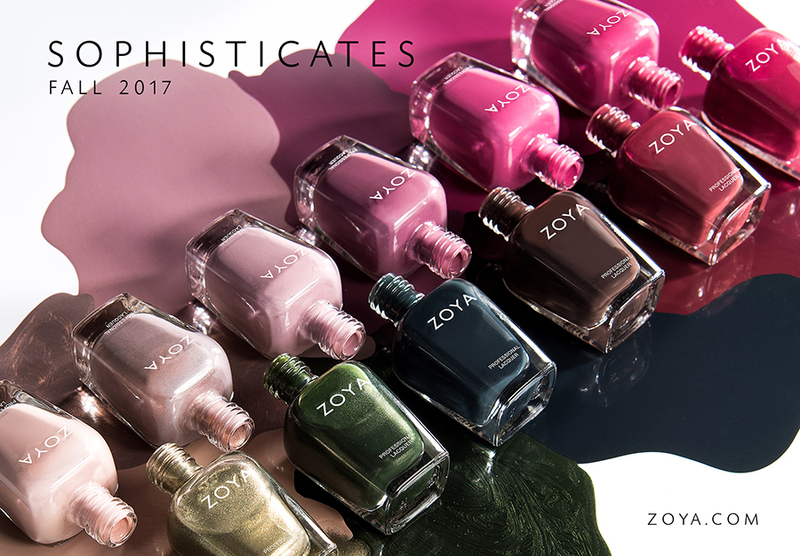 Zoya has us prompted with a big collection of cremes with some shimmers. I'm ready! It's almost the first of the month, so that means the Colors by Llarowe PoTM is about to be released. This polish has an awesome formula, and the jewel tones is readying me for fall! July Pusheen is doing what we all want to do...sitting in AC eating massive amounts of ice cream in the summer heat. Pastel Pusheens are so cute! I can't handle it. Good Morning! By now, I'm on a plane, off to start my vacation. I have lots scheduled though, so I'll still be around! I needed to share this polish with you, because you need to get it. I'm in love. Let's let the pictures speak for themselves. What better way to kick off a week than with KBShimmer's brand new Summer Vacation collection. I shared the press release last week, and since the polishes are available this Friday (7/28), time to make those wish lists available! All the colors are loaded with that special holographic flake that lays completely flat! As promised, I'm back with 3 of the Metallux collection! 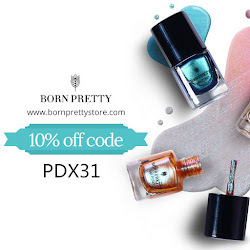 This collection released in June and contains 6 multichrome shifting polishes. I feel like this is the summer of multichrome. I've been featuring so much of it! These have great shifts in 2 coats, so let's check them out! Today I have a cute plate from Born Pretty! I adore cat images and this plate cracks me up! It reminds me of that image that went viral of all the penguins and there was one panda (or something like that). Well, this is the same! It's a bunch of cats with a random bear and dog lol. I don't know why, but this image cracks me up! Happy Wednesday! I recently received a sampling of some Dare to Wear polishes from Lechat. First, I'm showing off 3 MOOD polishes! I've been wanting to try these for a long time, but had no idea where to buy them. Well, guess what?! They just opened up their site for e-commerce and you can browse the huge collection of colors. The MOOD polishes have 48 colors! I have three cremes, but they have glitters, shimmers, and cremes! Oh hello! So I just found out I'm going on vacation! It was in the works but officially booked AND pushed up to July 25! So I'm trying to schedule some posts, but if you see a more quiet blog in August, that's why! I'll be on the road for 2 weeks traveling and decided not to bring any laptops/tablets. Anyway, today I have a pretty manicure with multichrome everything, so let's get to it. Good Morning! All the rage in the nail world are these loose powders. I had so much luck with the loose flakies from Beauty Big Bang, that my next order, I went with holographic powder. Since I don't really use gel (despire having two lamps, and about 75 gel polishes LOL), I tested this with regular polish. Well, I have more to learn, so I figured I would share my experience with you! Today, you are in for a treat. Multichromes are all the rage right now. If you remember back in October, a tiny group called Multichrome Madness formed, and Paint Box Polish was the first to make a custom. Well, Paint Box Polish is now Stella Chroma and she's re-releasing the coveted Amortentia, along with a gorgeous new release! These are available only through July! If you like multichromes and exclusive polishes, you will want to join the group HERE. Oh Hello! I'm here to share the highly anticipated Summer Vacation collection from KBShimmer! If you remember the Polish Con exclusive, We Make Your Dreams Come Blue, you know everyone freaked over the awesome finish! Now we get an entire collection of this finish!! If you are a nail polish addict, storage solutions can be tricky! While I have my IKEA Helmers for my main storage, I actually take nail polish to friends and family to do their nails. I usually toss it all in a makeup bag, but now, I can be much safer with Color Clutch! Do you ever have accidental manicures that you become so obsessed with? I loooooooooove this manicure! Something between the base color, the sparkle, I love it!! Hello to a brand new week! I'm kind of in shock that it's basically mid July already. Summer is basically over haha. Okay, I'll slow down! Jessica Cosmetics has a Phenom collection, which I've shown before. Phenom is like gel without the curing. It's supposed to last for 14 days! Now, I can't remember the last time I wore a manicure more than 7 days, but this polish definitely lasts on my nails! Happy Saturday! Today is particularly happy because it's my niece's first birthday!! I'm totally confused where time goes! To celebrate her birthday, I'm rocking these nails! Her bedroom is purple and apparently the cupcake frosting will be purple, so I followed suit! I received these dried flowers from Beauty Big Bang, and thought it would be a great addition! Girly Bits CotM: What the Hell Was I Thinking? and Let's Do This Again! I'm here today with the June CotM from Girly Bits. No, I'm not late posting, because these pretties will be available for all of July. I actually love the CotM! I look forward each month to see what Pam will come up with and the punny names she always has! This one was inspired by her Indie Expo event! She put so much work into it, and I hope to go next year! I have the Colors by Llarowe July PoTM, which will be available on July 10th for a 24 hour period. Rebellion is a great festive red jelly to welcome July and summer! I love red pedicures and I can see this on my toes ASAP! Are you recovered from yesterday or your long weekend? Today, I'm playing around with neon glitters from Beauty Big Bang. 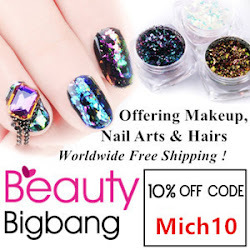 Beauty Big Bang is an online beauty shop that has tons of makeup and nail accessories. The best news is that this is my second order, and it arrived in 2 weeks! I love that it's so much quicker than other stores! Happy Fourth of July! Today marks our country's independence so you've probably been seeing a lot of red, white, and blue manicures! I usually try to do a few nail arts but this time, it's just the one. I did these last night and I'm wearing them right now! I love when I'm actually blogging a manicure I'm wearing. I am loving the Polish Pickup theme for this month! Cocktails and Mocktails leads itself for so much inspiration! I love Moscow Mules, but I've never had a blackberry one! I love that Stella Chroma took her inspiration from it. This is one amazing polish. You DON'T want to miss it. I mean it. Hi All! Let's give a giant hello to July! Today I'm sharing Alter Ego's contribution to The Polish Pickup which has a theme of Cocktails and Mocktails! I swatched this before my nail break, hence why my nails are so long! Which nail length do you prefer? !